Rebecca Molyneux is CBM UK’s Programme Manager for West Africa. 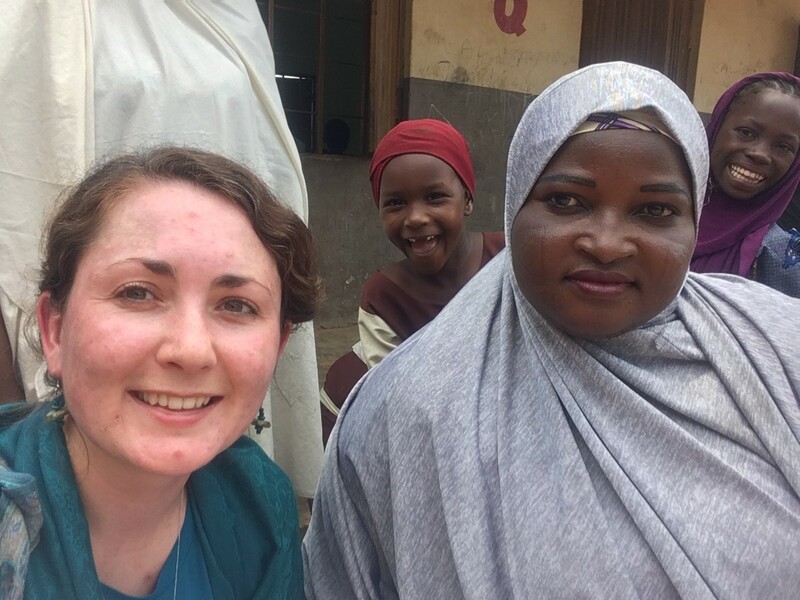 She recently visited one of CBM’s partners in Nigeria who are working to tackle violence against women and girls with disabilities. In this blog, she shares the stories of two women she met during her visit. 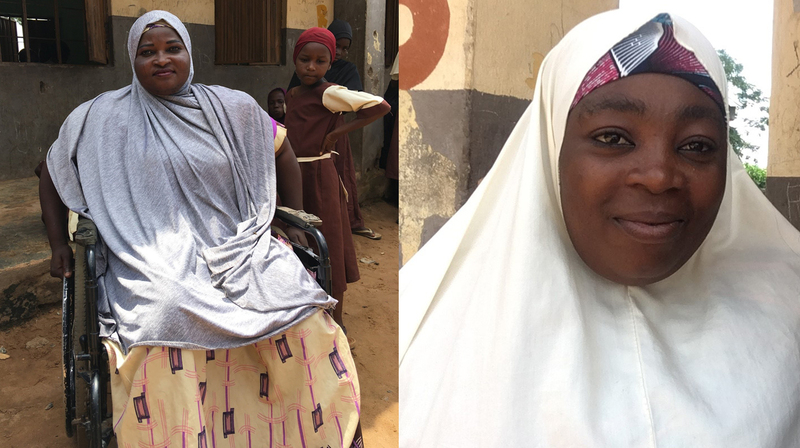 During a visit to Nigeria last month I had the privilege to meet some of the women our partner, the Disability Rights Advocacy Centre (DRAC), are working with to tackle violence affecting women and girls with disabilities. CBM UK is supporting DRAC to carry out a three- year project called Respect Not Abuse, which tackles violence against women and girls with disabilities through advocating for changes in government policy and working with specialised schools and communities to raise awareness and address violence. I travelled with the DRAC team to Karamajiji, an area on the edge of Nigeria’s capital city, Abuja. The centre of Karamajiji looks just like many other poor areas of the capital. We arrived there via a bumpy unpaved road, and were immediately ushered in to meet the Emir or traditional leader of disabled people in the state, Alhaji Sueiman Muhammad Katsina. He is a leader of people with physical impairments, and uses crutches himself. After receiving prayers and a message of support, we left his throne room and crossed the road to the school, where a group of ladies using wheelchairs had assembled to talk to us. The DRAC team started to interview the women with disabilities who had gathered to find out who might want to work with them to tackle violence in local communities, by advocating to those without a disability and explaining the challenges women with disabilities face. While they discussed the practical arrangements, I took the opportunity to meet some of the women and learn more about their stories. Rabi is a wheelchair user who has lived at Karamajiji for around five years, having moved there with her husband. She has three children, aged 6, 4 and 3 years. 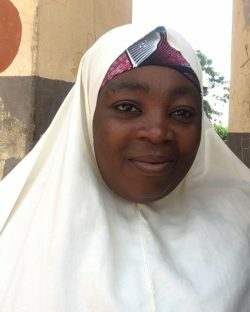 Her son is currently attending primary school, but she does not have the means to send any of them to secondary school. Her only income is from the ‘small money’ she makes from time to time producing and selling liquid soap. She described some of the challenges she faces living in Karamajiji. Because of the low quality material her house is made from, ‘batcha’- cardboard held together with wood, when it rains the water leaks in and she has to put plates everywhere to catch the drips. This disturbs her sleep. The family also struggle with mosquitoes because of poor sanitation in the area. As a wheelchair user, she struggles to get to the land available to grow crops; indeed the unevenness of the school compound where we met struck me immediately, making moving round in a wheelchair very difficult. Her husband gave up his government job to start a small shop selling provisions; however thieves broke in and stole the stock in the shop. Her husband then tried running a motorbike taxi instead, using her savings to buy the motorbike. Again thieves came and stole the motorbike from them, so her husband now has no means of earning money. I also met Rukaya, who had moved to Karamajij 10 years ago to follow her husband; she originates from Maiduguri, a city in the North East that has been affected for the past decade by violence. As well as being a mum of five children aged from 8 to 15 years, Rukaya works as a fashion designer and runs a small shop. She is able to send her children to school and trains up two other women as voluntary apprentices. Healthcare was very important for both the women I met. Rabi mentioned that in the past, healthcare workers in the area would embarrass them because of their disabilities, whereas now she felt their attitudes had improved thanks to DRAC’s work to raise awareness. However Rukaya had experienced difficulties getting treatment at some of the local general hospitals, who would send her to a private hospital because of her disability. As well as the higher costs of care, she also had to travel further and pay more to get to the hospital. Being able to trade on an equal basis was also important for both women. Rabi felt that community members were open to buying from her, whereas Rukaya had found it more difficult to get customers as a disabled person. “Only those who know me bring me work”. Images: Top - Rabi (left) and Rukaya (right) from Nigeria. Middle - Rebecca (left) and Rabi (right). Bottom - Rukaya.